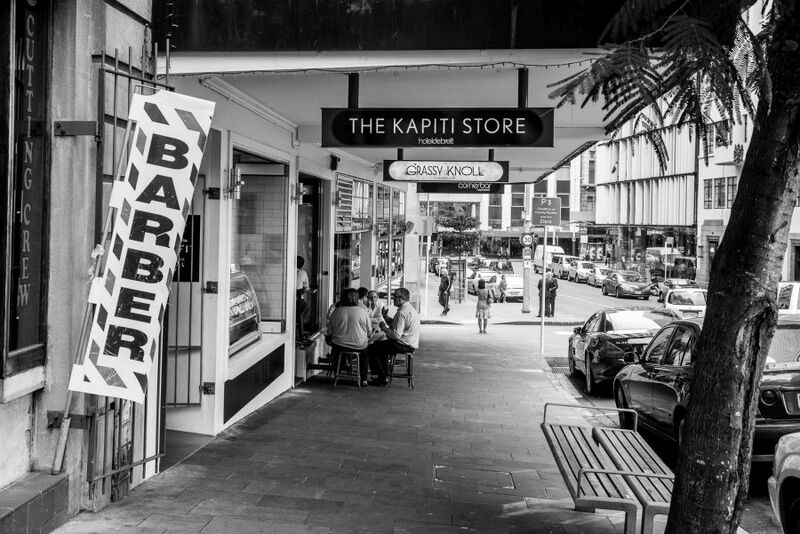 During our stay in Auckland, we walked up and down Shortland Street many times, passing The Kapiti Store at the Hotel deBrett building. 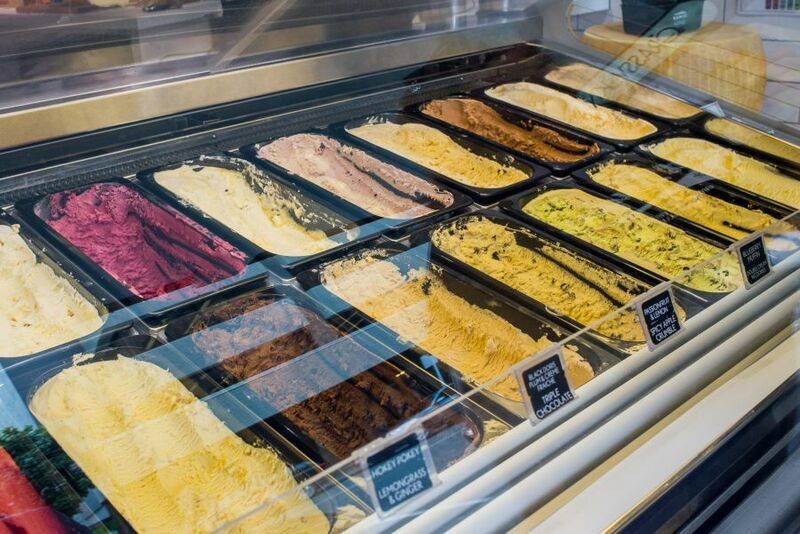 I may have gazed longingly (some might suggest lustfully) at the frosty display of ice cream at the front of the shop. It really was just a matter of time before we gave in and stopped for a taste. Well, I needed sustenance before and an elixir after trudging up and down the sloping street. You can tell the who Aucklanders are: they’re striding briskly and apparently effortlessly up and down those hilly streets while the rest of us visitors groan and moan about our aching shins and creaky knees. My smile grew wide as I walked through the shop. In the fridges it’s all cheese, and on the shelves, delicious things to eat with the cheese. 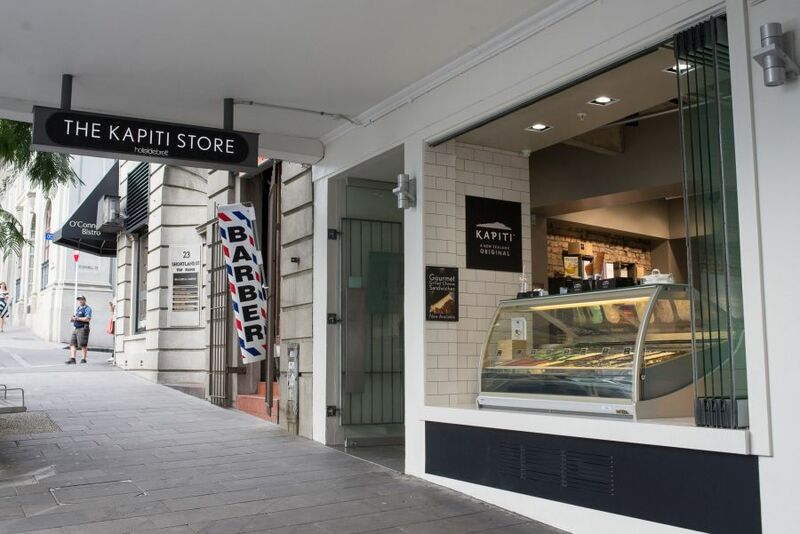 The friendly staff will talk about the cheese-making process and the different varieties of cheese, and they’re more than happy for you to sample the cheese. It would be such a waste to shop here on a full stomach. 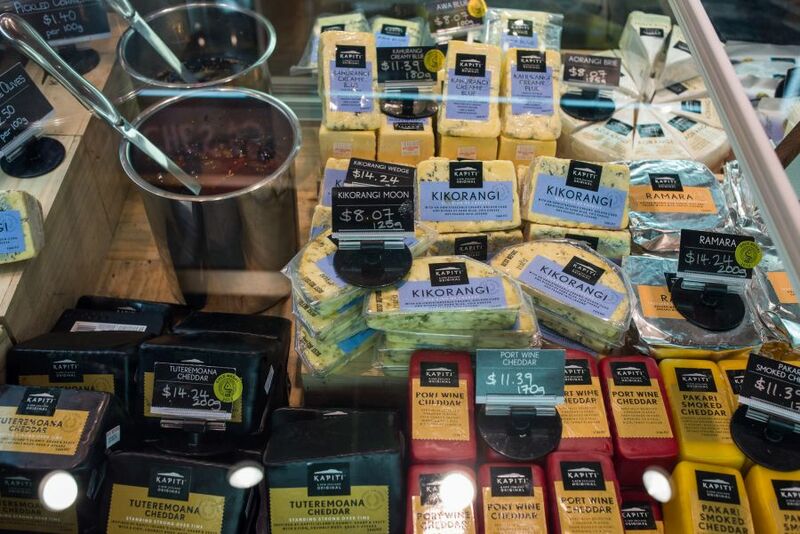 We sampled the triple-cream Kikorangi blue (“Kikorangi” means “sky blue”) and the Tuteremoana cheddar (aged for 3 – 4 years), which was my favourite. We tasted the cheddar topped with Pepler smoky balsamic jelly, which is made from grape juice, balsamic vinegar and liquid Manuka smoke. The smoky balsamic jelly and combination with cheddar was a new taste sensation for us. If you get the chance, it’s superb. Being surrounded by cheeses makes me happy. Of course, eating cheese makes me even happier. 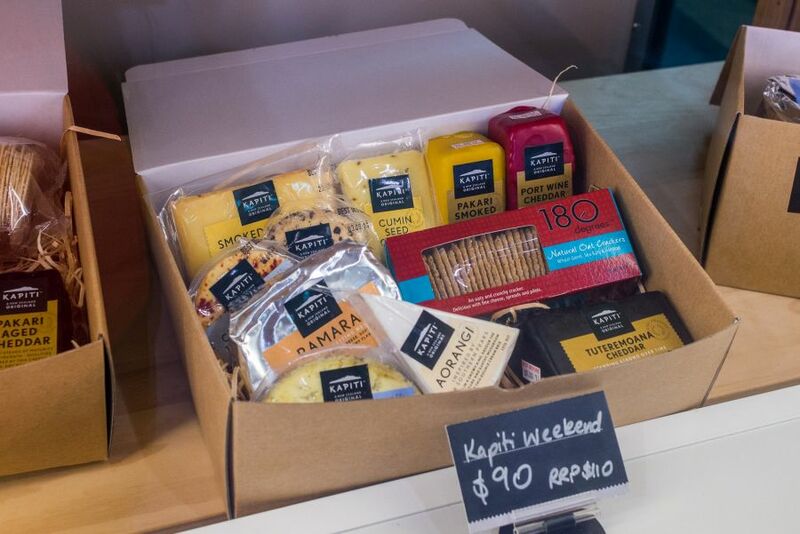 Buy a box of cheeses and have a Kapiti Weekend. I reckon this box needs more crackers. 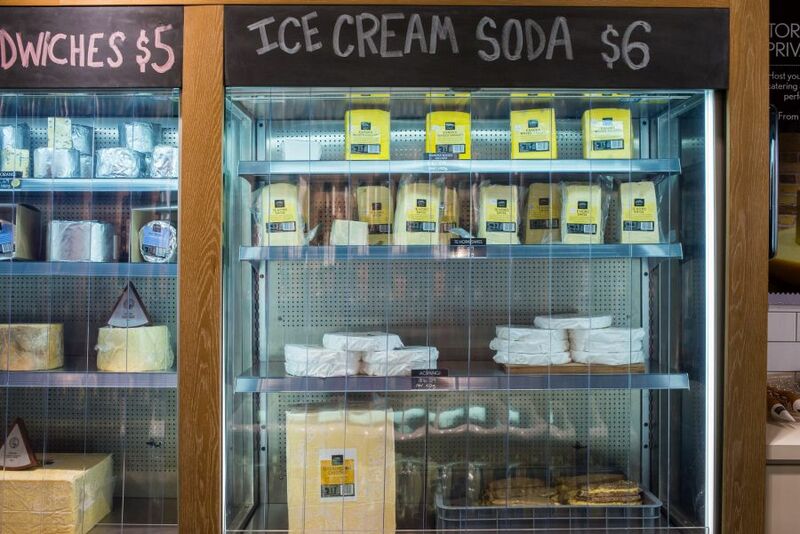 Cheese fridge, treasure trove, or both! 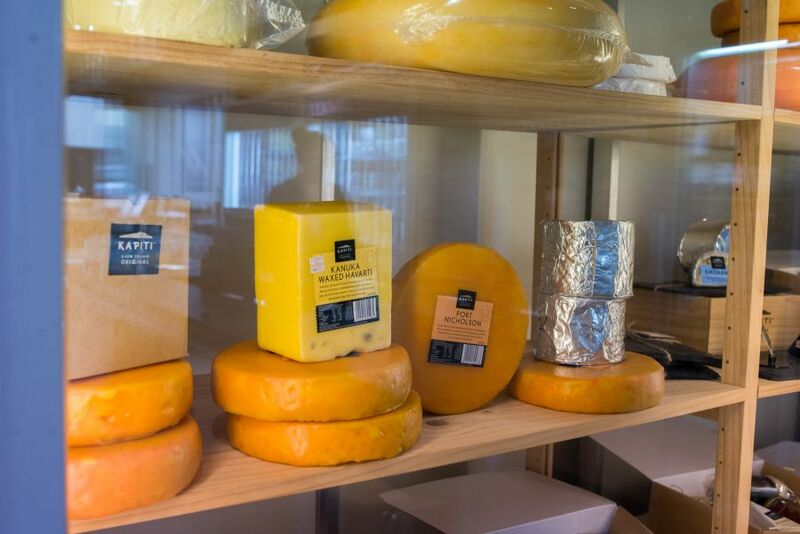 On the bottom shelf – possibly one of the best ever cheese sandwiches, made with Kapiti Tuteremoana cheddar and toasted to order, a great snack at only NZ$5 each. 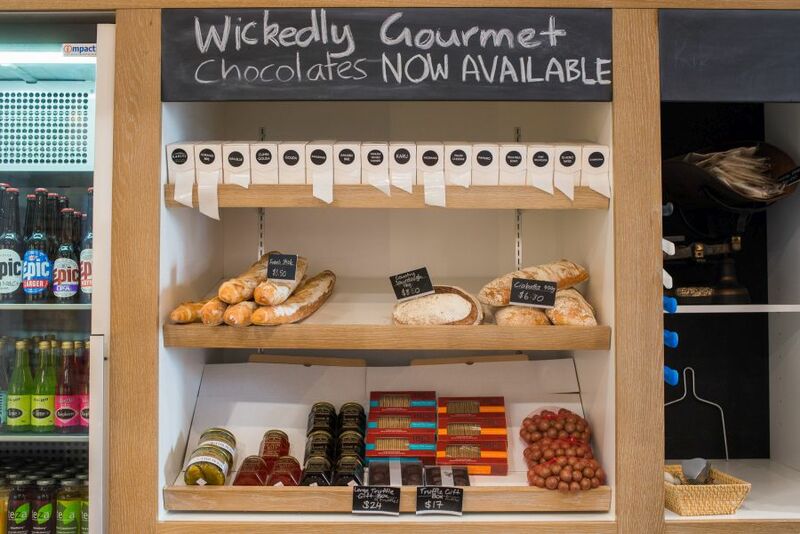 More goodies to go with cheese, including loaves of crusty bread, crackers, jellies, pickles and chocolate. When the staff on duty found out I was a blogger, they brought out a big cheese for me take pictures of. I admired, desired and photographed it. What else makes me happy? Photographic shenanigans with a 10kg cheese. And that Kapiti Store toasted cheese sandwich. Oh yeah baby! 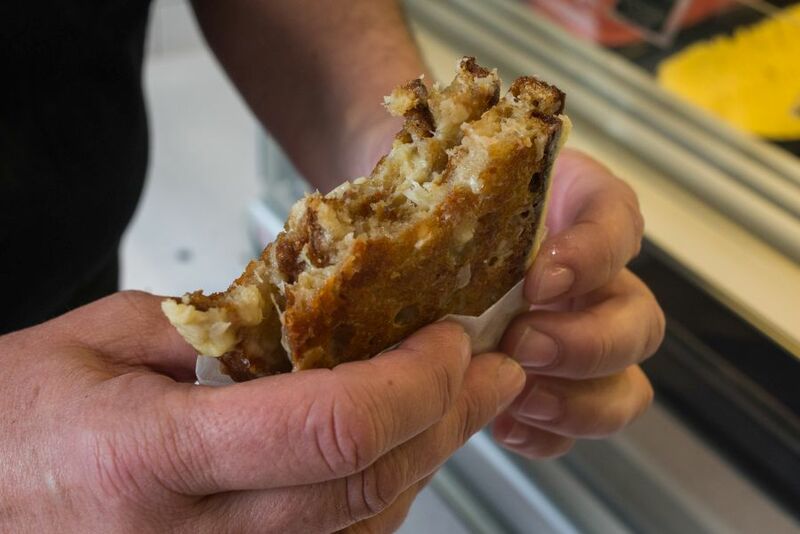 It tastes buttery even though there’s no butter at all – it’s simply two slices of sourdough bread with lots of cheese, just the magical effect of a magnificent cheddar melting, its gooey goodness seeping through the crisp, golden bread. After sharing a toastie with Jac I knew we had to buy a block of the Tuteremoana cheddar to take home. Toasted cheese sandwich made with Tuteremoana Cheddar. As we hadn’t eaten breakfast yet, I forgave Jac chomping through the sandwich before I could take a photo. 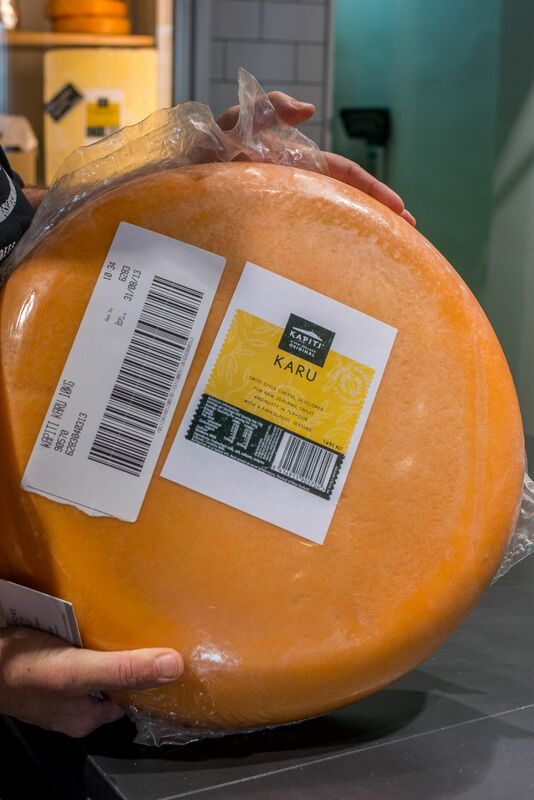 Bringing cheese home from New Zealand: easy! As we were halfway through our trip, we didn’t buy cheeses that day. 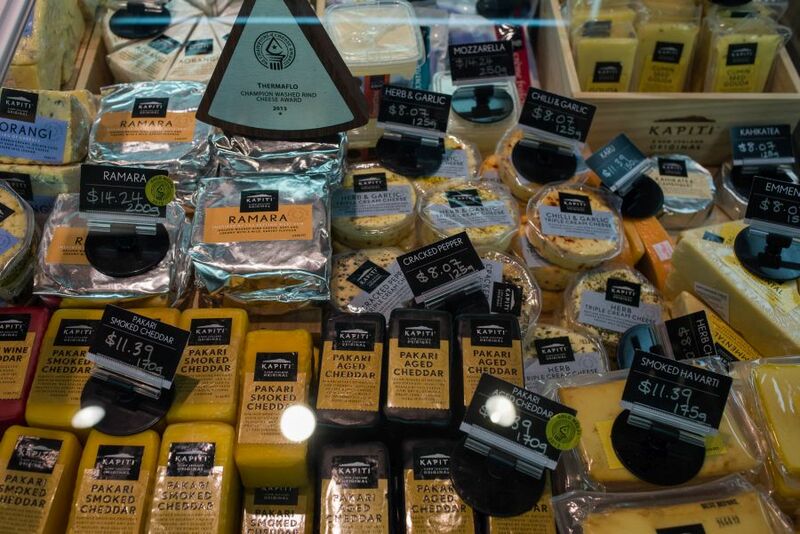 We came back on our last morning in Auckland and bought three cheeses to take home: Tuteremoana cheddar (200g, NZ$14.24), Kikorangi blue (125g, NZ$8.07) and Kanuka waxed Havarti (125g, NZ$8.07). We packed the cheeses in our checked-in luggage presuming they would stay colder in the cargo hold of the plane than in the cabin with us. We bought a cute little hard-shelled case at Strandbags on Queen Street in Downtown Auckland specifically to store our shopping for the journey back home to Perth – our precious cheeses, a bag of kiwifruit lollies and two bottles of wine – I’ll tell you more about the wine in an upcoming post. Jac declared the cheeses on her Incoming Passenger Card and at Perth International Airport, a quarantine officer asked where they were from. We told her we bought them in Auckland and she waved us through without inspecting them. I was so relieved, not because I was concerned the cheese would be pronounced as contraband or confiscated; I was worried about having to open the little case of cheese, lollies and wine because when we were packing, Jac came up with the idea to use our rolled up dirty socks and knickers as extra padding, especially around the wine bottles. I can’t believe I went along with that plan – can you imagine? It’s funny how you only think about these things when it’s too late to do anything about them. I’d have been mortified to have a quarantine officer digging around our dirty underwear! A lucky escape, and I won’t do that again. Buy cheese, YES; use dirty undies as padding around declarable food items, NO! I still have visions of what could’ve been: an open suitcase, a quarantine officer being very professional and only ‘seeing’ the declared items, but for anyone else looking on, socks and undies strewn on the counter, me blushing brightly and Jac not at all perturbed (that’s my sweetheart!). That situation was just screaming out for a camera crew from Border Security to be filming at the airport that day. Now that I’ve mentioned dirty undies for the first and hopefully last time on The Food Pornographer, let me bring you back on topic – with ICE CREAM! Kapiti lemon meringue pie ice cream was highly recommended by a couple of my readers, but there was none available that day. We sampled lemongrass and ginger, hokey pokey and spicy apple crumble, all good – but Jac chose the very fetching Black Doris plum & creme fraiche ice cream. I’ve noticed recently that I seem to gravitate towards the coffee flavours now whenever I eat ice cream – I chose the affogato. It proved a great choice. Fabulously creamy vanilla rippled with espresso. 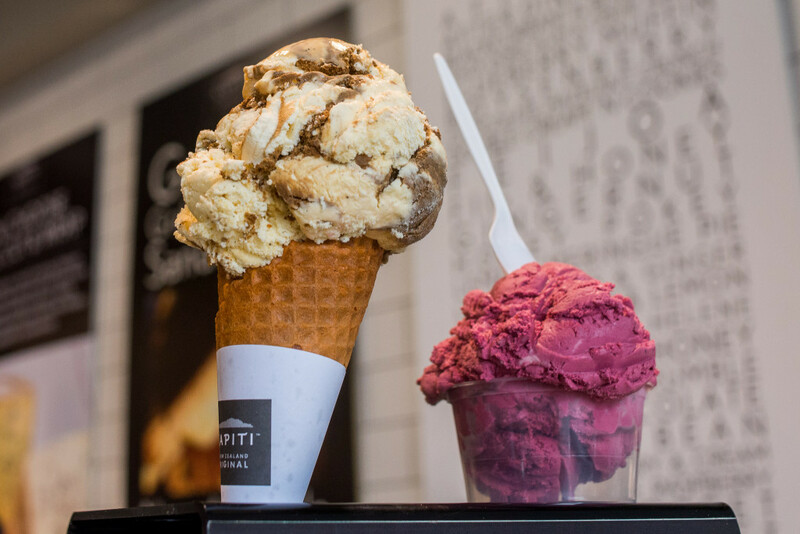 Affogato (cone) and Black Doris plum & creme fraiche ice cream (cup). A cup is not as messy, but I reckon there’s something special and extra satisfying about eating an ice cream cone. 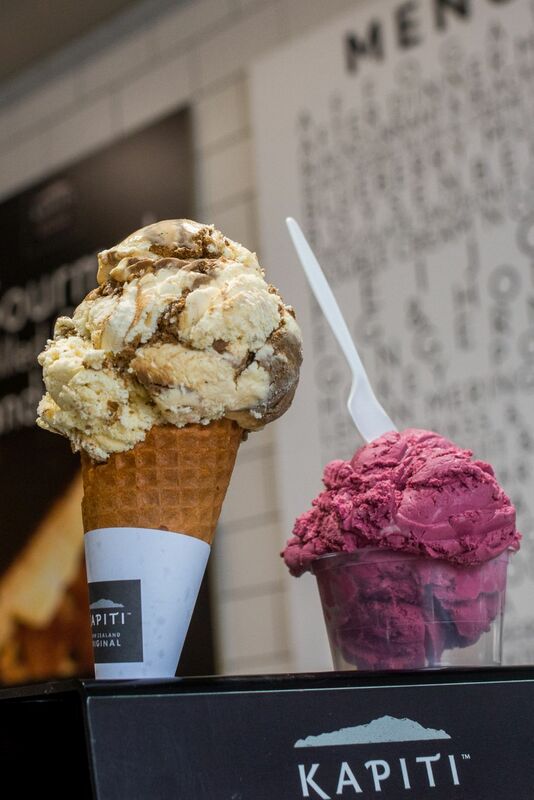 Cheese and ice cream for brunch – only on holiday! Time for a walk and lunch, then back up that hill again to our hotel to pack for the next stage of our trip. You’re not still thinking about undies, are you?